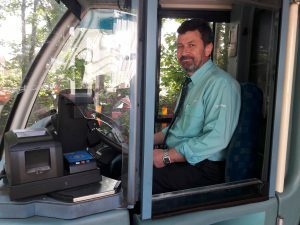 Arriva, a leading European passenger transport provider, and Ticketer, one of the UK’s largest Electronic Ticket Machine (ETM) suppliers have joined forces to take the hassle out of catching the bus for Arriva passengers. The roll out of new contactless ETMs to 3,500 buses will begin in November and be complete by summer 2019. The project will replace every on-board ticket machine with Ticketer units, which also accept QR codes, mTickets, Apple Pay and Android Pay. The switch to Ticketer follows a successful six-month trial in Guildford, by the end of which nearly 30% of transactions were contactless. During that trial Arriva Bus saw a steep increase in passengers using contactless, particularly across weekends, suggesting that younger passengers may be taking advantage of the service and moving out of the parental taxi service. As well as helping to make travel more convenient for passengers, Arriva UK Bus expects that contactless payments will reduce the cost of cash collection and processing as well as incidents of fraud. In addition, faster processing of transactions will reduce waiting times and ensure services run on time. Neil Shah continues, “This is a clear way in which technology helps us match customer need with commercial sense. Of course, we also hope it will encourage more people out of their cars and onto a bus, reducing congestion and pollution on our roads. “We will have access to key information about how passengers use buses so can track how they respond to this new service and learn from it. Cornelie Alecsandrescu, the lucky driver who took the 100,000th contactless ticket sale in Guildford.